Knowing how to remove wax buildup from furniture is an essential part of preparing a piece for painting. It’s also an excellent way to keep your natural-look wood furnishings in gorgeous condition. We all love the look of lovely wood furniture polished until it gleams, but after years of using commercial furniture polish, it’s vital to remove wax buildup from furniture. Doing so will reveal its original beauty and eliminate grungy smudges. Removing wax buildup can also make a piece of furniture feel brand new. Why? Because the silicon in commercial polish builds up with each application, often trapping humidity or moisture between layers that eventually makes the surface feel sticky. If the process of removing wax buildup from furniture conjures images of a grandmother scrubbing furniture maniacally, it needn’t. These days, few people use the heavy wood furniture wax favored by past generations. That’s one thing about modern commercial furniture polish: it may attract dust, and it may turn your furniture cloudy and sticky, but at least it’s easy to remove. • Dust furniture before attempting to remove wax buildup. • To remove buildup in crevices, dip a soft brush (i.e., a baby toothbrush) in the vinegar-water solution and scrub, rinse immediately and buff dry. • In humid areas, or if you have several layers of wax buildup, you may need to repeat the process a couple of times. You’ll know you’ve removed all of the wax build-up when you can slide your hand against the grain of the wood and feel the wood’s grain, not the wax. 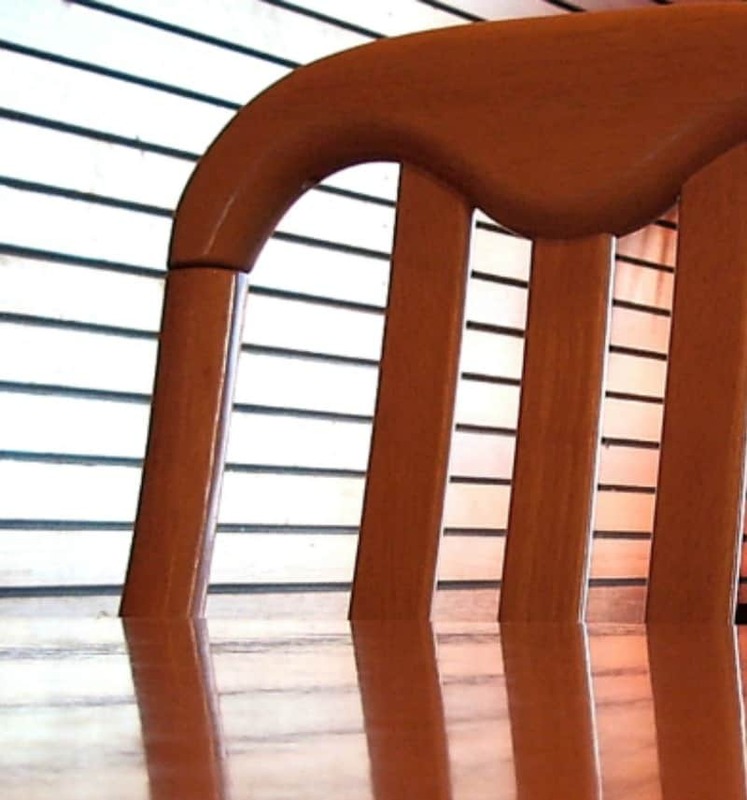 • Treat scratches before polishing using this method to fix scratches in wood furniture. 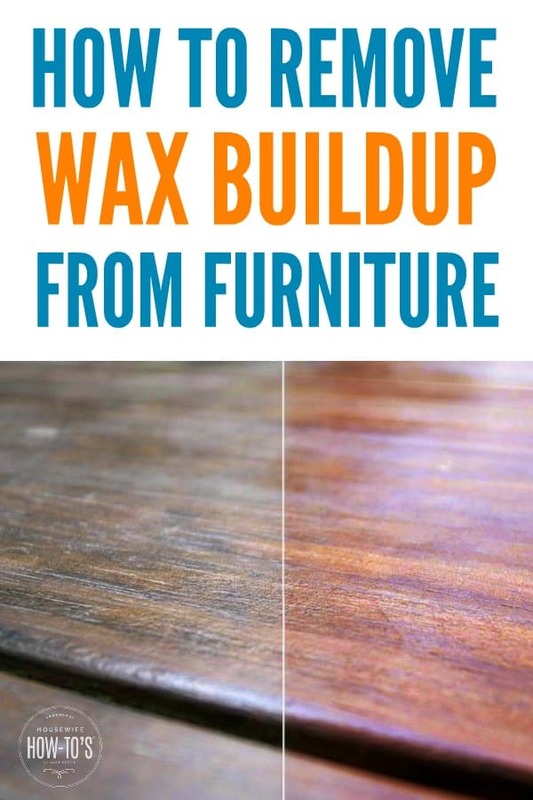 Here are two ways to quickly and inexpensively remove the sticky wax buildup from wood furniture. Use caution and test the solution in an inconspicuous spot first. For antiques, it’s best to see a professional. Combine 1/2 cup white vinegar and 1/2 cup water in a shallow bowl. Spray or apply with cloth in the direction of the wood grain. Using a clean cloth dampened with this mixture, gently rub against the grain to lift wax buildup. Rotate your material often, so you’re always working with a clean spot. Follow with another clean cloth dampened with plain water to remove the remaining residue then follow with homemade furniture polish to shine. Steep three black tea bags in 1 cup hot water for ten minutes. Remove bags and allow the liquid to cool. Use a clean, lint-free cloth to apply to furniture following the grain of the wood. Wipe off with a damp cloth and buff dry. Restore shine using a homemade furniture polish and buff to a cloud-free shine. To be clear, for light wood use white vinegar and water solution applying this first application with the grain of the wood. Then with same solution using a different cloth rub AGAINST the wood grain to remove wax build up. In other words I go AGAINST the grain to rub off wax buildup? You go in both directions to remove wax. I painted an entire dresser with finishing wax, thinking it was a dark chalk paint. What should I do? Can I paint over the wax? Or do I attempt to remove the thick layer of wax first and then paint? I don’t paint furniture much and have never tried it over a piece that’s been waxed. I’d think, however, that you’d need to completely strip or sand the wax away to get good adhesion with the paint. I have a lovely polished wood table that came from South America ( Louie Phillippe table by Willis and Gambia. We’ve had the table for about 15years and was told not to polish it. I had forgotten this comment and remembered being given a lot of tins of furniture beeswax which I had never used and stupidly decided to give my beautiful table a polish with it. Well all I can say is the table looks patchy, cloudy, and scratched but it isn’t really scratched but badly marked. I’m actually quite upset about it as I’ve really looked after this table and other furniture that we have as you can imagine ,and really don’t know what to do. To have a French polisher look at it and try to sort it would be about £500-600 pounds which I just cannot afford. The shop that actually sells the same table but in a different wood suggested I use methylated spirits on a soft cloth working the way of the grain to get rid of the cloudy ness, which I have done and although it has improved it it still looks marked. Can any of your remedies work safely for me to try? With furniture of that quality and price, I’d recommend talking to a professional. I have floor wax stains on my dark furniture. Should I use the black tea method on it and if not what should I use. I’m a bit confused by floor wax stains on your furniture. Did you try polishing furniture with floor wax? Unfortunately, if that’s the case, there’s no easy way to remove it. Household ammonia will strip that wax, but it smells horrible and you need to take serious precautions to protect your skin. You also need excellent ventilation, because ammonia will irritate your lungs and eyes. My so used bathroom cleaner to wipe down the table now one area looks dull and the other side shiny. How do I fix this? I don’t honestly know the answer. My best guess is that you need to wax and buff the dull side. Doesn’t it work wonderfully? As someone who routinely forgets that she’s brewing a cup, I love that I don’t always have to throw it out. It’s not too hard. You can always sand it, too. It’s probably trapped condensation from the heat of the plate. Try rubbing oil or even mayonnaise into the area and covering it with plastic wrap overnight. The next day, wipe away the oil/mayo and it should look like new. Sorry for being stupid,but is it safe to assume you mean white vinegar, also my table is oak,any other ideas? Eek! No, you don’t want an acid (in tea) that breaks down any wood fibers nor water that swells them, nor something with color that stains. Apply the same or equivalent polish again (that built up) and rub vigorously while it has softened up the old polish. Using your logic, Dave, one could never even mop their wood floors because the water might make the wood swell. Obviously, that’s wrong; people have been damp mopping wood floors for centuries. In fact, most wood flooring manufacturers recommend using a damp mop to clean them. As for the tannic acid in tea, it’s so negligible and in contact with the wood for such a short time that it wouldn’t have a chance to break down the wood fibers. If tea were that strong, people wouldn’t be able to drink it.